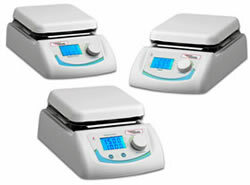 Ceramic work surface, 6.5 x 6.5"
EMS hotplates, stirrers and hotplate-stirrers feature an exceptionally durable, chemical resistant, white ceramic work surface. Their space-efficient design (7 x 10.5" footprint), makes them ideal for use on crowded benchtops and inside bio-hoods. Advanced microprocessor controls allow quick, precise adjustment of speed and temperature. The large, backlit LCD display provides constant visualization of the speed and temperature while a safety LED indicates when the top plate is above 50°C. 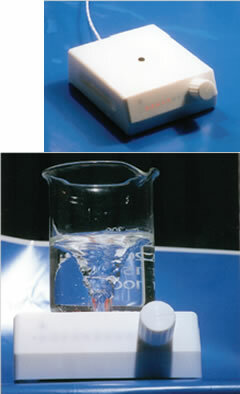 In addition, an optional probe is available for applications that require precise temperature contol. When connected, the probe provides direct feedback to the microprocessor, which continuously adjusts and maintains the selected temperature in the sample within ± 0.5°C. 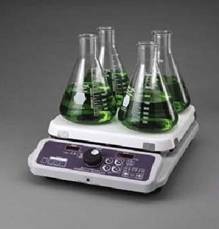 With a square 6.5" work surface, all three models are compatible with a wide variety of popular sizes of borosilicate glass beakers, flasks, bottles and other vessels. An optional support rod is available for mounting thermometers, temperature probes, etc. 16.5 x 16.5 cm 6.5 x 6.5"
Dimensions 7 (W) x 10.5 (D) x 4 (H)"
17.75 x 26.5 x 10 cm 7 (W) x 10.5 (D) x 4 (H)"
Exclusive Microprocessor design ensures faster and even heating. 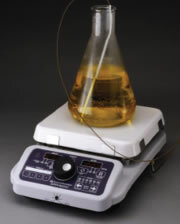 Exclusive closed-loop stirring monitors and regulated stirring speed. Notes: 230 volt Units come with UK plug. Continental European and Italian plugs are available upon request. 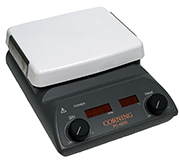 The Corning temperature controller accessory works with all Corning hot plates, models PC-400, and PC-600, and hot plate/stirrers, models PC-420, and PC-620. The controller plugs into the socket on the back of the hot plate. It can be used to control or monitor the temperature of the hot plate. The temperature controller features a "PTFE" coated probe, which allows the controller to be used for more applications. Corning Stirring Hot Plate model PC-420 (EMS #72350) is replaced by our new Digital Stirring Hot Plate, model PC-420D, and model PC-620 (EMS #72349) is replaced by our new Digital Stirring Hot Plate, model PC-620D. Corning® has now added innovative microprocessor technology into their units with digital display which optimally controles the heating and stirring to the 5" x 7" (12.7 x17.8cm and 10" x 10" (25.4 x 25.4 cm) Pyroceram glass-ceramic stirring hot plates. 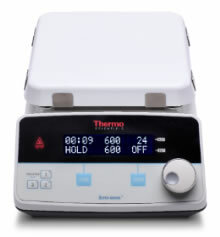 Closed-loop heating and stirring controls that monitor and regulate both temperature and stirring speed. Microprocessor maintains consistent and repeatable temperature setting from 25°C (if ambient temperature is 0°C or lower) up to 550°C. Digital LED temperature display is adjustable in 5°C increments and blinks until temperature is reached. Optional external temperature controller truly controls temperature inside the vessel and eliminates the need to closely monitor liquid temperature. Exclusive closed-loop stirring control monitors and regulates the stirring speed from 60 -1150 RPM for aqueous, viscous, or semi-solids solutions. 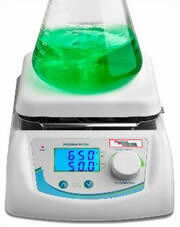 Digital LED speed display gives you better control of your stirring process. Stronger, larger magnet improves stir bar coupling combined with automatic up speed adjustment minimizes decoupling. Bright LED HOT TOP icon lights up when top plate is over 60°C, even when heat control is turned off. Separate temperature sensor provides power cutoff if unit overheats. Optional temperature controller will shut off unit when is not in liquid. Two piece casting design deflects spills away from electronic and includes a built in mount for an optional 18" (45.7 cm) support rod. 698W/5.9A 5" x 7" 10.9" x 7.8" x 4.4"
698W/3.1A 5" x 7" 10.9" x 7.8" x 4.4"
1113W/9.3A 10" x 10" 15.8 x 10.6 x 4.8"
1113W/4.9A 10" x 10" 15.8 x 10.6 x 4.8"
This temperature controller (model 6795PR) is designed to take the guesswork out of controlling liquid temperatures on the digital display PC-400D and PC-600D hot plates and PC-420D and PC-620D stirring hot plates. When in use, the controller icon on the display well be lit and the temperature control on the unit can set from 5 – 200°C. This is a 7/16" (1.1cm) diameter by 6" (16.5cm) support clamp for clamp for model 6795PR and 400188 (EMS 72351-21) temperature probes. Support has two openings, ⅓" (9mm) and 0.15" (3.75mm), for holding probes. It is designed to be used with a boss heat clamp (Corning® #440140) or standard right angle clamp. This is a stainless steel, two piece, 18" (45.7cm) support rod with a 5/16" (0.8cm) diameter that consists of two 9" rods that screw together. It screws into the base of Corning® hot plate and stirrer models PC-400/410/420, PC-400D/410D/420D/and PC-600D/610D/620D. This kit is designed for all Corning digital display hot plates and stirring hot plates (Models PC-400D, PC-420D, PC600D, PC-620D). It is voltage independent and includes a Temperature Controller (6795PR), a two piece, 5/16" (0.8cm) diameter, 18" (45.7cm) long support rod, and magnetic stir bar retriever. 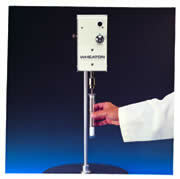 The Wheaton overhead stirrer is a compact unit with solid state speed control capable of providing RPM/torque combinations for most laboratory operation such as homogenizing or mixing. This Over Head Mixer should be attached only to Tissue Grinders with Teflon® pestles and with stainless steel rods. Unit and motor are mounted in a housing with epoxy finish and is provided with 6" aluminum rod and clamp for attachment to support stand. Keyless chuck accepts shaft sizes up to 5/16" (7.9 mm). Support stand is not included. One year warranty. 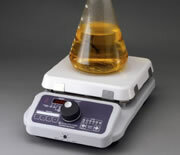 A New Concept in Magnetic Stirrers! All parts are fully encapsulated in a "PTFE" body to give a stirrer which is totally inert to the most aggressive laboratory conditions. All models supplied with 6" type K probe, detachable cord and retention bracket that prevents cord from accidentally removed. Hot surface alert systems protect from accidental burns. Independently adjustable over temperature protection circuit limits top plate temperature and prevent run away conditions. Calibration mode allows remote probe to be calibrated to external standard and at any temperature the user selects. Rugged aluminum surface provides uniform heat distribution and added durability to sustain point impacts that might break ceramic or glass surface. Seamless reflective white ceramic top enhances sample visibility and provides an easy-to-clean and alkali/acid resistant surface. (33cm) x 3.8"H (9.7cm) 7.25"x7.25"
(20.8cm x 33cm x 9.7cm) 7.25"x7.25"
72345-12 120 10.0 1200 11.3"W x 16.25"D X 4"H (28.7cm x 41.2cm x 10.1cm) 10.5"x10.5"
72345-20 220-240 5.6 1345 11.3"W x 16.25"D X 4"H (28.7cm x 41.2cm x 10.1cm) 10.5"x10.5"
All units operating temperature range is 540°C max temp. 72343-10 100 0.42 25 50-1200 7.25" x 7.25"
72343-12 120 0.41 25 50 to 1200 7.25" x 7.25"
72343-20 220-240 0.18 25 50 to 1200 7.25" x 7.25"
72346-12 120 0.41 25 50 to 1200 10.25" x 10.25"
72346-20 220-240 0.18 25 50 to 1200 10.25" x 10.25"
Accommodates sample weight up to 35 lb (15.9 kg) on the 10x10" models, 25 lb (11.5kg) on the 7x7" models. Unique, single knob design controls both heating and stirring. Set points go up slowly when the knob is rotated slowly, faster as the knob is rotated faster. The knob then is locked out to avoid accidental changes. All models supplied with 6" type K probe, detachable cord and retention bracket that prevents cord from accidentally removed, and include 2" x 3/8" dia TFE-coated stir bar. Walk-away timer shuts off heating, stirring or both after a preset user-defined interval. 72344-12 120 5.6 670 50 to1200 7.25" x 7.25"
72344-20 220-240 3.0 710 50 to1200 7.25" x 7.25"
72344-52 120 5.6 670 50 to1200 7.25" x 7.25"
72344-60 220-240 3.0 710 50 to1200 7.25" x 7.25"
72347-12 120 10.1 1210 50 to 1200 10.5" x 10.5"
72347-20 220-240 5.7 1365 50 to 1200 10.5" x 10.5"
72356-10 120 11.8 1400 1-370 10.25" x 10.25"
72356-20 220-240 6.1 1450 1-370 10.25" x 10.25"